1. Put the steaks in a shallow dish. Stir together the lemon juice, cumin and 1 tbsp oil, then smear over the lamb. Set aside for 10 minutes. 2. Meanwhile, toast the pitta bread lightly and when cool enough to handle, tear into bite-sized chunks. Stir together the remaining oil and the vinegar in a large bowl. Add the pitta, cucumber, tomatoes, mint and salad onions. Sprinkle over the sumac, season and toss everything together. Set aside; the bread will soften slightly while it sits. 3. Heat a griddle pan over a high heat. Season the lamb and cook for 4 - 5 minutes per side for medium rare. 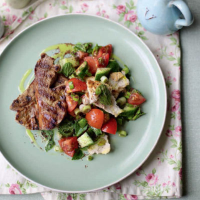 Serve with the pitta salad on the side.